Nate J. had the most liked content! Rider Selection: Don't Be "That Guy"
I'm usually the one waiting, Probably too much, Tip top, I invented it, know how - yes / done it - no, No, If the scenery is awe inspiring - yes, No, I have but have learned from that mistake, I have but have learned from that mistake - Sand is my Kryptonite, I watch and take pictures, I yell at them for scratching it, If the music in my helmet is really good maybe, I bottle it - sleeping in and making me watch you get ready while I twiddle my thumbs is my pet peeve, Don't you know how to use GPS? (No - double negative), Absolutely not, Absolutely not, If they want me to for some good video otherwise no. A note on the "Do you show up for rides you know are way above your ability" question. I feel that I have a decent skill set, and can handle some fairly gnarly terrain; although, an "expert" I am not. It is, however, tough to judge if one is entering into a ride on a trail that is above their ability when they have never ridden the trail before. When in that situation do your homework in advance! In relation to this specific adventure I believe we have all done our due diligence - watched the movie (not just the trailer), read ride reports, looked at pictures, and spoken to others that have done the entire trail. With that information you can make a decision base on your knowledge of your own abilities, and you willingness for it to go wrong. That little bugger (Kingston Mobilite G2) works like a champ. Copied from SD to external hard drive independent of anything but a smartphone. Powers the drive independently as well. Question on your Prism Eric - Used mine for the first time yesterday and have two issues. Wondering what you've found or come up with. 1st, the mount is wobbly and the camera shakes quite a bit - especially off-road. Second - Battery life! I got about 15 minutes of video on a fully charged battery, and my battery is down to one dot left. WOW! That's all we get on a battery? What have you found with battery life? My GoPro can pull off 2 hours of video on a charge! I picked up a pair of Sena 20S for my and my other half's helmets, so I'm good with the comms. Our other brand helmet comms were getting fritzy, so I had a good excuse. Thanks again for the offer though! Totally understand not wanting to part with your SD cards. I have a good external HD I can bring, but I really don't want to, or really have room to, bring my laptop. You know of any ways to copy an SD without an intermediate laptop? I've done some googling of the subject, but really haven't found anything viable. Picked up a 20S and a prizm online yesterday along with a few memory cards/batteries. Those combined with an ancient Gen1 Gopro and a still camera and I should be able to get some nice video/pics. What are others planning on having along for video/pictoral documentation? I hope to be able to edit up a nice video post trip! Unless someone else is already planning to do so, I'd propose that I collect memory cards at the end of the BDR so I have tons of stock, and return the cards with content intact via mail later. Thoughts? I've had a bit of time with the Shoei Hornet X2 now - here are my thoughts. Until now I've always worn 'standard', non-peaked helmets in a wide variety of brands from AGV to Shoei. My most recent, which I still own, is a Shoei GT-Air. I've been wearing sunglass style goggles with my GT-Air which work fairly well, but still allow a bit of dust and grime to reach my eyes when off-road. I wanted a helmet that I could wear motocross style googles with, and that also had a peak to provide some shade. After I narrowed my list of potential new helmets down to the Arai XD-4, the Bell MX-9, The Touratech/Nexx Aventuro/XD1 and the Icon Variant I read the reviews, scoured the forums, talked to owners, compared the specs, and finally decided on the Shoei Hornet X2. I'm not here to tell you all the reasons why I did not choose the others helmets; however, as that would require a short novel. I'm here to tell you why I chose the Shoei Hornet X2, and what I think of it now that my head has been inside it. There are many factors that one want’s to consider when choosing a helmet - fit, comfort & weight, quality, safety, visibility & goggle fitment, airflow, sound level, and drag just to provide a short list. I’ll touch on each as it relates to this helmet. Fit, Comfort & Weight: Everyone’s mileage will vary when it comes to fit and comfort. Not only is this a very subjective variable, but everyone has a slightly different shaped noggin. What fits and is comfortable for me may not fit well or be comfortable for you. I like a snug fitting helmet that provides just enough pressure on my cheeks to make them ‘pooch’ up a little above the cheek pads. I’m ok with a helmet that takes a bit of effort to get over my head, but feels snug once inside. I have an ‘intermediate oval’ head which is great as most helmets are made with this head shape in mind. My head measures in at 23”, and if you look at Shoei's size chart that puts me smack dab in between a Medium and a Large. Knowing my fit desires I went with a Medium and the helmet fits perfectly. My head makes even contact with the interior in all locations, there are no pinch points, and the helmet simply fits perfectly. Yes, this helmet is the heaviest in it’s class. The specifications state that the helmet weighs 3.9 pounds, but I found that my medium weighs in at 1.7Kg/3.75Lbs. Full disclosure - this was using a non-calibrated luggage scale, so it’s likely that either the helmet is closer to it’s specified weight, or the published weight is for an XL. Compare this weight to the Touratech Aventuro at 3.21 Pounds, or the NEXX XD1 at 3.3 pounds and the Hornet X2 is a heavyweight. In my mind weight is not the only factor when choosing a helmet, and a half a pound isn’t really a ton when you really think about it. Shoei really does a good job of disguising the weight on this helmet though. The helmet is VERY well balanced. Other reviews have detected a slight amount of forward weight bias, but my highly calibrated neck muscles cannot detect this weight bias at all. I wonder if a correctly fitting helmet makes the difference here? Shoei also seems to have been able to reduce the weight once air is moving over the helmet. What I mean by this is that the weight seems to disappear completely once the aerodynamics of the helmet and the peak come into play at speeds above 25 to 30 miles per hour. Quality: Shoei is known for their quality, and they kept that reputation alive in this helmet. Construction is top-notch which is expected at this price point. The graphics on the Seeker version are flawless, the lines are clean, the shield is perfectly formed and seals evenly across the entire circumference of the seal, the shield has a thicker ridge in its construction its top edge to provide added rigidity, the shield is crackable with 6 detents as it is raised an lowered, and one can tell a lot of thought went into the design not only in the helmets visual appeal, but also it’s function. The ONLY niggle I can find is that when the peak is removed, the vent hole that routes the venting from the peak into the helmet is exposed on the top of the helmet. If one was riding in the rain with the peak removed it is conceivable that water would work it’s way down onto the top of your head. Shoei really should provide a plug for this hole when the the peak is removed - Without actually wearing and using the helmet this might actually seem like it may be a problem, but please see my comments in drag section below. Safety: This helmet is both Snell approved and DOT certified. The cheek pads are removable with the helmet on by pulling on two red straps attached to the cheek pads to ease removal of the helmet by emergency technicians. And, not really related to safety specifically, the chin strap is over length a bit so one doesn’t have to completely unbuckle the D-ring buckle to remove/don the helmet. Really not much else to say in respect to safety, although almost ALL of the variables discussed in this review do relate to safety in one way or another. Visibility & Goggle Fitment: The visibility out of this helmet is stellar… period. The field of view is very wide - I can just barely detect the edges of the field of view in my peripheral vision, and the face shield is optically correct with zero abnormalities. I tried both the FOX AIRSPC goggles and the lesser expensive Scott Hustle goggles in this helmet. The FOX AIRSPC goggles don’t really fit inside the opening - the nose guard has to be removed to get the goggle inside the helmet at all, and there is very little space for airflow around the goggles once they are fitted to your face. The Scott Hustle’s fit perfectly; however, with enough room for ample airflow to enter the goggles. As an added bonus Scott has a wider variety of available lenses in varying colors for the Hustle goggle than is available for the FOX AIRSPC - Scott Hustle for the win! Also, Shoei claims that the visor can be closed with goggles in place. While this is mostly correct it is not entirely accurate. The visor can be mostly closed with goggles in place which is completely understandable as there is a strap in the way of full closure. See selfies below Airflow: The helmet comes with not only a pinlock anti-fog lens, but also a nose guard and chin guard. Now, I haven’t had the opportunity to use any of the three yet as average temperatures here in Utah at the moment are 90 to 100 degrees, but from my experience with the GT-AIR the pinlock lens is indispensable in the cold weather and works very well. The nose guard helps keep your breath off the shield while directing outside air onto the shield, and the chin guard helps keep the cold brrrr air off your chin and neck. In the heat with both the nose guard and chin guard removed airflow inside the the face area of the helmet is exemplary! You don’t have air blasting on your face drying out your eyes, but you can feel the air circulating around your face. The forehead vents direct air in and onto your… forehead (imagine that), and the vent on top of the peak directs air down into the top of the helmet, around your head, and out the back. When your head is all nice a sweaty is when you can really tell it’s working as you get a wonderful cooling sensation all around your head as the exterior air works its way around your head drawing the hot air out the back - sublime. Sound Level: Again, Shoei quality in play here. This helmet is quiet for a peaked helmet with an elongated chin bar. I actually have a calibrated decibel meter, but couldn’t figure out a way to use it to measure dB levels inside the helmet, so you’ll have to settle with my calibrated ears instead. I was so surprised by how quiet it seemed to be that I ran straight home to make a quick comparison, threw my GT-AIR on which is known to be a quiet helmet, and made a quick comparison. The Hornet X2, in my opinion, is not discernibly louder than the GT-AIR. I tried to tell my ears to notice a difference but they simply couldn’t. Not really anything else I can say here - the helmet is quiet. I can’t complain. Drag: Let’s face it. What we really all want to know is how drag relates to the Peak. So here goes - Shoei pulled off some kind of magic with the peak on this helmet. It’s like it’s not there! My personal top speed on the freeway is 80 Mph, and at that speed wind pull on the peak is all but undetectable. I thought that maybe my Tenere’s windshield combined with my short stature might be to blame for such perfection (With my windshield and my height the air blast hits my head about 2” above my eyes) so I stood on the pegs at 80… Ok, a tiny bit of pull there but nothing to whine about at all, and when do you stand on your pegs at 80 Mph? So, let’s take it down a notch to 40 Mph standing on the pegs. The peak isn’t there. It’s like it doesn’t exist. You say you want to turn your head to check over your shoulder? Go for it. You’ll find out the peak is there when you turn your head, but it doesn’t pull at all. You can just kinda feel that it’s there, but there’s no real pull to the side happening at all. In normal sitting position the peak blocks the sun at about 20 degrees above the horizon. Anything below 20 degrees above horizon and you can tilt your head forward slightly and all is well. The peak on this helmet is superbly designed and sprinkled with magic Shoei dust. I can’t rave enough about it! How does this relate to the little vent hole in the top of the helmet when the peak is removed as mentioned earlier? I see no reason to remove the peak, so who cares about the hole - I’ll never see it. I believe Shoei knew this, so didn’t bother creating/manufacturing a little hole plug for you to lose and re-buy, and lose, and re-buy. Summary: Overall I am very happy with this helmet and don’t have any complaints. It fits very well, is comfortable, and its weight is very well disguised utilizing good balance and aerodynamics. Shoei didn’t disappoint in the quality department as expected, it has both Snell and DOT approval, visibility is great, goggles fit well inside as long as you get the right goggles, airflow is superb, its quiet, and most surprisingly, the peak has almost undetectable drag when seated, standing, or turning your head. Overall this is an excellent helmet - you will not be disappointed. The only cons I could find, weight and the hole in the top with the peak removed, are negated by excellent design and aerodynamics. I can find no viable cons with this helmet. 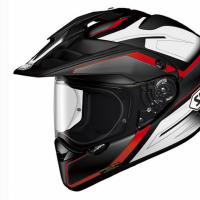 The Shoei Hornet X2 is available in two versions - The standard Shoei Hornet X2 and the X2 Seeker. The Seeker version is exactly the same construction as the standard version, but adds graphics and color as well as cost. The following description is directly from Shoei's Website. DESIGN CONCEPT From the very beginning phases of conceptualization, the sole purpose of creating the all-new Hornet X2 was to offer serious dual-sport enthusiasts the perfect helmet for all corners of their journey. Striking the optimal balance between on-and-off-road form and function is no easy task, but in the end, the Hornet X2 defines what we all love most about dual-sport, adventure riding; it knows no bounds. Designed to maintain peak performance in every condition thrown its way without compromising the core values of a long distance touring helmet, the all-new Hornet X2 is a true all-road, all-element helmet. At first glance, you'll quickly admire the design characteristics that make the Hornet X2 a true hybrid between a premium road and off-road helmet. The mouthpiece and chin bar area incorporate the best features from both worlds; its shape was designed to improve air intake and ventilation performance, all the while giving the rider the additional air space needed to accommodate heavy breathing during demanding off-road riding. Abandoning the traditional mouthpiece of an off-road helmet, the Hornet X2 provides the additional protection needed when weather conditions become adverse, and the multi-stage lower vent shutter allows the rider to fine-tune airflow for every riding conditions. Performance, aerodynamics, ventilation, functionality, and long-distance comfort... The helmet for every road, Hornet X2. V-460 VISOR The Hornet X2's all-new V-460 visor spent countless development hours in SHOEI's wind tunnel and on the road to perfect the proper balance between aerodynamics and traditional visor functionality. The innovative "wedge" shape along with strategically placed vent louvers allow wind to pass through unobstructed during high-speed riding, ultimately reducing lift and drag. Along with superior aerodynamic qualities, the V-460's shape was strategically designed to push air into the Hornet X2's upper air intake for optimal cooling, all the while maintaining its fundamental purpose of providing sunshade and roost protection during off-road riding.Rounding out the V-460's innovative features, easy-to-operate quarter-turn screws allow for quick removal and installation of the visor without the need for special tools. CNS-2 SHIELD/QR-N BASE PLATE Along with the Hornet X2's large eye port, SHOEI's all-new CNS-2 shield offers unparalleled vision across the entire optical range. In addition to protecting against 99% of the sun's damaging UV rays, the CNS-2 shield offers a distortion-free view thanks to SHOEI's 3D injection-molding process. Additionally, an innovative rib on the top edge of the shield improves rigidity and eliminates bending that may occur during opening and closing. Coupled with the all-new CNS-2 shield, the Hornet X2's QR-N base plate system facilitates quick and efficient shield changes for easy adaptation during your journey. The strengthened spring-loaded base plates pull the shield back against the improved window beading to ensure a dust, wind and waterproof seal with each and every closure. A new shield locking mechanism rounds out the Hornet X2's advanced shield system. VENTILATION A well-ventilated helmet is essential to dual-sport riding and the many challenges it can present thanks to varying speeds, weather conditions, and levels of physical exertion. During the design process of the Hornet X2, SHOEI utilized its state-of-the-art wind tunnel facility to help develop the optimal balance between airflow, silence, and functionality. Equipped with a large, multi-position lower air intake/defroster optimized for fresh air inhalation and clear vision, two shutter-controlled upper air vents for optimal air intake and head cooling, four uniquely-positioned rear exhaust outlets to take better advantage of negative pressure suction, and three neck outlet vents work together to yield unrivaled cool-air intake and hot-air expulsion. 3D MAX-DRY INTERIOR SYSTEM II The Hornet X2 is equipped with a fully removable, washable, and replaceable 3D Max-Dry Interior System II. SHOEI's exclusive Max-Dry System II liner material absorbs and dissipates sweat and moisture twice as fast as traditional Nylon interiors, making it ideal for those long days on the road or trail. The 3D center pad components are three-dimensionally shaped to match the contours of a rider's head, allowing for an extremely comfortable fit while maintaining the firm hold necessary for distraction-free, high-speed riding. Additionally, the Hornet X2's 3D-shaped cheek pads are available in multiple thicknesses for a fully customizable fit.The Hornet X2 also includes a removable breath guard, chin curtain, and removable ear pads to complete the comfort package. I'll agree with you on the bear box campgrounds. As an alternative, if its necessary, there are other methods though I grew up around bears in the mountains of Colorado (fed a wild one next to my house a carrot once which was stupid), so they probably don't concern me as much as they should! lol. Pavement? Phhht! Lets ride the shoulder of the highway just to be different... As far as the 'expert' sections I figure we can just take those as they come. From my understanding they all have bypasses as you say. Of course, one never really knows, unless they've done the trail before, what makes the section expert. It could be a rather benign trail with a really nasty section that makes it expert as I am very well aware! I guess that's why they call it an adventure - lol. I don't want to make things harder than they have to be, and do want to enjoy the trip without a lot of extra pain, but some technical stuff would be fun. As far as being in a rush - I hope we're not in a rush. I have 6 days of wag on the tail end of the trip that I now plan to shoot up into Canada with, and I'd like to not necessarily take our time, but not be in a race either. I'd like to enjoy the trail, the riding, the people, the views, and the culture as well. Good point on the bears - when in bear country I bring a long piece of line and hang anything smelly high in a tree far from camp. It's worked for me so far! My plan is the same Rodney - camping the entire route Minus the reservations. I figure we can just camp wherever. Part of the 'Adventure'! How do you all plan to get to Jarbidge? I have family that lives near Elko NV, so I'll probably come up 225 from there and then hit the dirt toward Charlston. Should be a good primer for the trip. Thanks for the butler maps and stickers Eric! Cashola on it's way! Return trip? As I'm heading back to Utah mine will probably differ a bit. My other half is planning to ride up to the border to meet us at the end of our last day and ride back with me via the scenic paved routes through Idaho - We're planning about a 4 day return trip to Utah. I told her I'd be uber stinky, but she didn't seem to mind! haha! VERY nice write up Bryan! I may just do this! Thanks for all the detail - betting I can do this with zero questions based on this.